Hello there guys! Today I have some fun water inspired nails to share with you. So I was recently wearing a gorgeous blue and decided to do some under the sea nail art on top which ended up perfect for today! So lets take a look. Yesterday and Wednesday I posted about Pretty Beautiful Unlimited's new collection that is coming out tomorrow. (You can read about it HERE) Anywhooo, I ended up wearing Keep Swimming! It reminded me of the ocean and at the time the next day I was going to the ocean so it seemed fitting. After wearing it alone for a day I then decided jelly fish would look good on top! So soon as I got a chance I painted on some pink jelly fish. I usually see then quite often at the beach, but haven't lately which is probably a good thing. :) Always looking though so we don't end up with a Friends incident. ;) I really like how they came out too! I wasn't sure this idea would play out right on my nails but it worked pretty well. I started by painting the jelly fish in white and then filling it in with watered down pink. Also both the pink and the white were acrylic paint just in case you were wondering. :) It gave it a neat effect. Then I went back in with the pink at full consistency and added a few blobs here and there to make it more like a real jelly. Well I think that is it for today! I hope you have enjoyed this post! I will talk to you all later! These are so fun and cute! Love those little jellyfish! Thank you SO much! 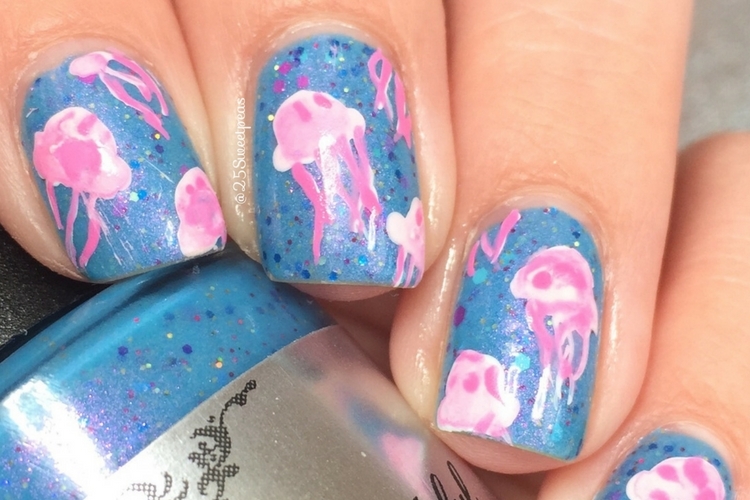 I've always wanted to pull of a jelly fish mani and I think I finally have!